Tiraphan Hasub evokes boho chic with the design of this bracelet. She braids the dark brown bracelet by hand with macramé techniques, expertly adding green and brown enhanced agate as well as brass beads. The bracelet closes with a ringing brass bell. According to Buddhist customs, ringing bells bring good luck. 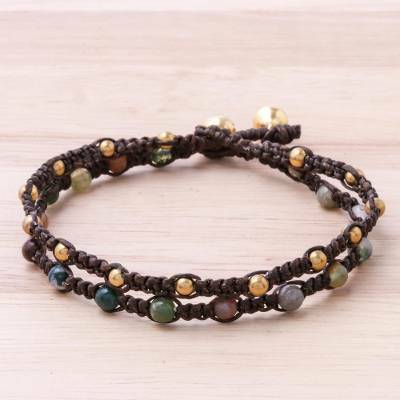 You can find brass braided bracelet 'Green Boho Chic' by Tiraphan Hasub in jewelry categories such as Birthstone Bracelets, Agate Bracelets, Brass Bracelets, Polyester Bracelets, Braided Bracelets and Wristband Bracelets. Enjoy exploring these sections for other Novica treasures. "something I can wear everyday "
Love how soft and sweet it is, the subtile details and I LOVE the little bells.